1. This poll will be open for 7 days from the date it is posted. 1. The entry of the first place winner of the poll will be used on all products at the AHS CafePress Shop. 1. The voting should be based on the merits of the work only, and not on the person who made it. If you entered this contest DO NOT do anything to identify your work during the voting. This means that if someone has a question about your entry you will have to wait until after the contest is over to answer it. 2. The creator of each entry will be revealed after the poll is closed. 3. DO NOT CHEAT. The staff will disqualify any vote that looks suspicious for any reason. If we believe a contest entrant is cheating, his/her entry will be removed, and he/she will not participate in the contest anymore. 4. AHS's decision shall be final and appeals shall not be entertained. 5. The winner will not receive any reimbursement or commission for use of their image. 6. The winning entry will be the complete possession of AHS to be used as desired for current and future products. Respect the participants by viewing the full image for each entry before voting! 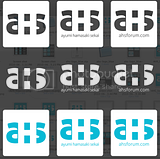 Also keep in mind that logos with the words "Ayumi Hamasaki" will be excluded, as they cannot be used per CafePress rules. Please only consider logos that only say "AHS." For those that only include "Ayumi Hamasaki" (entry 02, for example) will be used without those words. Last edited by AHS Staff; 30th June 2010 at 04:06 PM. Oooh I like 4, 5 and 9, but I chose Entry 08. It's really clever! Man, 5 or 8, 5 or 8...... GAH! I went with 5 just cuz I kinda like the ayu-ish feel of it, but 8 is SO well-done, and very pro - and it's nice to see multiple treatments of it. So if 8 wins I won't be sad but I'm going with 5. I really like 6. I love the use of tags in it. Even though there aren't that many entries this time, it's extremely hard to choose. I keep going back and forth. I'm gonna have to vote sometime later, I can't choose right away. 09 is really cool!! It looks like something on the hood of a car!! i'm torn between number 3 and number 8. ugh...i'm not sure which to pick! Entry 6: I mean no offence to the maker...but it looks a lot much like the old Soshified layout.As a fan of both Ayu and Soshi, I certain don't want Ayu fans to be accused of copying their layout as well(Yes there have been a few before). Even though it was most likely unintentional and since text isn't a completely new invention haha, but honestly it was the first thing that came to mind when I saw it. I don't know which one to choose, should I go for the ones that looks pretty or which one looks most like a real logo.